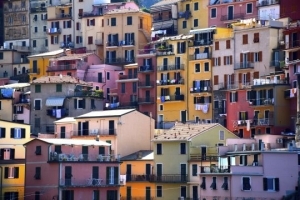 Home / News / Visit the Cinque Terre - but leave the car at home! 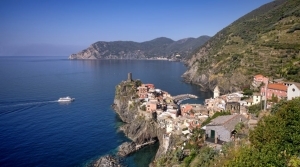 Visit the Cinque Terre – but leave the car at home! The Cinque Terre is situated in Liguria, and forms a rugged part of the coastline of the Italian Riviera. “The Five Lands” as it is sometimes known as, is made up of five villages: Monterosso al Mare, Vernazza, Corniglia, Manarola, and Riomaggiore. Monterosso and Vernazza were the first, whilst the other villages grew later, From 1600, the Cinque Terre experienced something of a decline which was only reversed due to the military construction of La Spezia and to the building of the railway line between Genoa and La Spezia in the 19th Century. The downside of the railway though was that it gave the locals the opportunity to move away from the poverty and isolation of the area. It wasn’t until the 1970’s that the development of tourism brought back wealth. Together with the coast line, these 5 villages and the the surrounding hillsides are all part of the Cinque Terre National Park and is a UNESCO World Heritage Site. It is a spectacularly steep landscape, where over centuries people have built terraces right up to the dramatic cliffs overlooking the ocean. 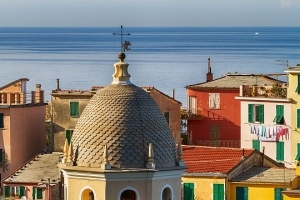 The terraces appear almost to be balancing against the odds, as can be seen on the image above of Corniglia. A large part of its charm is the lack of visible of vehicular traffic and outside development. Walking paths, trains and boats connect the villages, and cars are largely unable to access them from the outside. There is one into Vernazza which was opened in June 2012. It is very narrow in places, and will take you to a parking area half a mile from town. The advice would be not to travel by car at all, and to use the trains, boats and paths to visit the villages. There are many local trains which connect the villages to Le Spezia. Unlimited day passes are available for tourists, and the trip from one village to another is five minutes or less. A passenger ferry also runs between the five villages, except Corniglia. The ferry enters Cinque Terre from Genoa’s Old Harbour and La Spezia, Lerici, or Porto Venere. There is also a spectacular walking trail, known as Sentiero Azzurro,or the Azure Trail, which also connects the five villages. 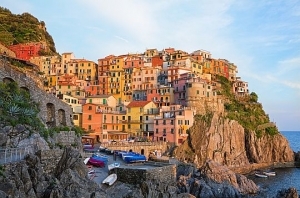 The trail from Riomaggiore to Manarola is called the Via dell’Amore or the Love Walk, and is wheelchair-friendly. The stretch from Manarola to Corniglia is the easiest to hike, although the main trail into Corniglia finishes with a climb of 368 steps. The houses are brightly and distinctly coloured which add to the stunning location. It is not purely asthetics which made it this way however. It has a more practical origin, so that whilst the fishermen were out at sea catching fish, they could still distinguish and keep their eye on their home with ease. Porto Venere is a town and commune located on the Ligurian coast y in the province of La Spezia. It comprises the three villages of Fezzano, Le Grazie and Porto Venere, and the three islands of Palmaria, Tino and Tinetto. In 1997 Porto Venere along with the villages of Cinque Terre were designated by UNESCO as a World Heritage Site. Porto Venere is one of the maritime villages that participate each year in Palio of Gulf. This is a traditional procession of the White Madonna along the streets of the village. There are also several feasts over the year such as the Feast of St. Venerius (patron of the Gulf of Spezia and lighthouse keepers of Italy) in September, and the Feast of the basil, celebrated every April. It has a popular shopping promenade in the Doria quay and picturesque Alley and panoramic views to the church of St. Peter and the Doria Castle. The harbour of Portovenere, although the smallest of Liguria, in the summer season is always sold out and also host many celebrities. The Gothic Church of St. Peter, consecrated in 1198. It was built over a pre-existing 5th century Palaeo-Christian church, which had rectangular plan and semicircular apse. The new part, from the 13th century, is marked externally by white and black stripes. The Romanesque church of St. Lawrence, erected in 1098 by the Genoese. It probably occupies the site of ancient temple dedicated to Jupiter. The church was damaged by a fire in 1340 and by the Aragonese attack in 1494, and was further restored in 1582. The Doria Castle with the walls around the historic center. The Grotta dell’Arpaia (now collapsed), known as Byron’s Grotto, from which the English poet Byron swam across the gulf of La Spezia to San Terenzo to visit Shelley in Lerici, in 1822. The medieval nucleus of Le Grazie is set around the 14th-century Church of Our Lady of the Graces; nearby is a medieval convent, which once belonged to the Olivetans, and the remains of the 1st century BCE Roman villa of Varignano. Finds from recent excavations at the villa are held in the Antiquarium della Villa Romana del Varignano in Porto Venere. In Fezzano the medieval alleyways are noteworthy, along with the church of St. John the Baptist (1740) and the recently restored Villa Cattaneo. Among the natural places in the Porto Venere is the famous sea caves Byron (Cala dell’Arpaia), Azzurra or Blue Cave (semi-submerged) and Tinetto; the cavity of the Doves and the wall of Tino, the shoal of Dante and Small and Big creeks. The Byron’s cave, named after the English poet George Gordon Byron in this place that drew inspiration and meditation for his literary works, it is located at the spur of rock below the church of St. Peter and the old defensive position, the marine cave has a minimum depth of five meters and a maximum of twenty along the side. In addition to wines, other popular local drinks include grappa, a brandy made with the pomace left from winemaking, and limoncello, a sweet liqueur flavoured with lemons. Famous artists including Paul Klee have been inspired by the colours of the Cinque Terre villages and the dramatic coastline. The best place to based is in Porto Venere and to travel by boat so that you can paint the villages from the sea. 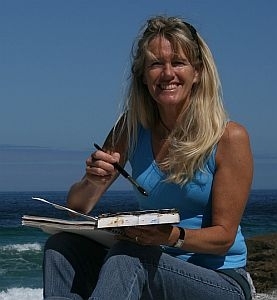 You can join artist Hazel Soan on a special painting holiday in early June 2016, when the weather and light should be perfect for artists.